I would like to continue my question to another problem. I have the DTM (XYZ) and I have another dataset of XYZ and Temperatures measured in 18boreholes. So I want to display the distribution of temperature in the area in 3D. There is a video (using XY and sodium) in youtube on that but its not my case. Could you please help me again? One way to model your data is to use the Utilities gridding and solid modeling menus. Choose the Utilities Map | Grid-Based Map menu to grid the DTM XYZ. 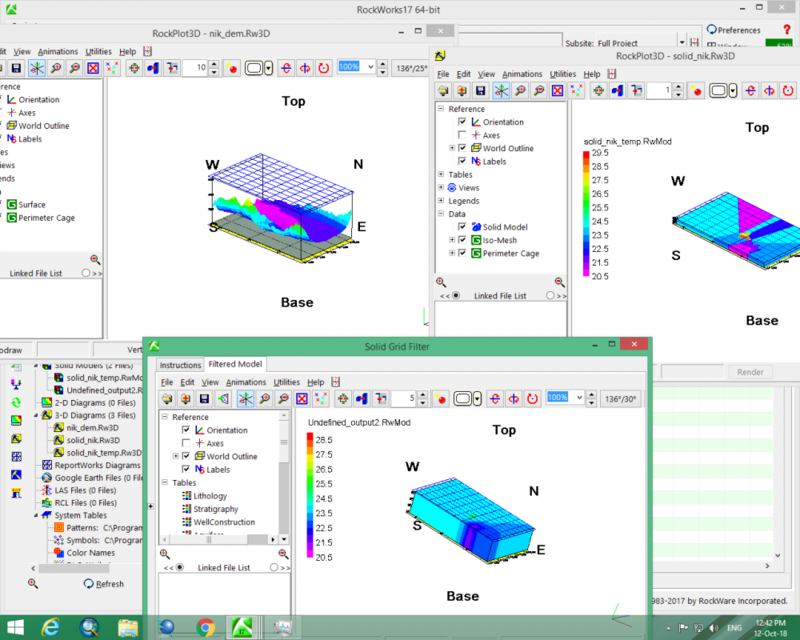 Choose the Utilities Solid | Model menu to create a solid model of the XYZ temperature data. Choose the Utilities Solid | Filters | Grid Filters | One Bounding Grid menu to filter the model with the DTM grid and replace the nodes above ground with NULL. Thank you again for your imediate responce. Please have a look in the attached image. on the top left image i depict the DEM (vertically exagerated by 10). on the top right is the temperature solid model. the image at the bottom is filtering the solid model with dtm (vertically exagerated by 5). It does not seem to follow the topography. Sorry I missed your message. Check your Z values in the DEM and in the Temperature model to make sure they are in the same range. If that does not resolve the problem, backup your project with the Borehole Manager File | Backup Database menu command and send the ZIP with your DEM and Temperature models to [email protected] and I'll take a look.